Radio telescopes are large dishes (or bowls) that reflect radio signals coming from the stars and concentrate them at a single point. In this way a weak signal can be made strong enough to be detected by a receiver. You can build a dish that concentrates not radio waves, but light. STEP 1: Find a bowl with a rounded interior surface (not flat on the bottom). Sometimes salad bowls, especially wooden salad bowls, are designed like this. STEP 3: Cut out a piece of paper about an inch wide and six or so inches long. 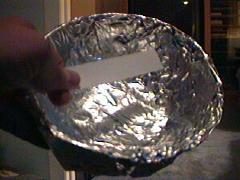 STEP 4: Point the interior of the bowl toward a strong light at some distance. Then, without putting your hand between the bowl and the light, move the paper between the open part of the bowl and the light just outside the interior of the bowl. You should be able to find the bright spot where the light is concentrated. Warning: If you do this using the sun as the light source it may get hot enough to ignite the paper. Be prepared! Don't burn your hands. Note: The more the shape of the bowl is parabolic (that is light coming in all over the bowl reflects toward a single point) the more the light is concentrated. Bowls are often spherical, though, so the bright spot might not be a single point.